The 100% natural Merino Kids Baby Sleep Bag is the world's finest baby sleep sack. Its remarkable natural merino fabric and award-winning design help your baby to sleep safely through the night. Crafted from superfine allergy-safe merino wool, the Merino Kids baby sleep sack is luxuriously soft and light upon your baby's body. It fits babies safely up to two years and its quality workmanship guarantees years of wear. Babies can take as long as a year to develop the full capability to regulate their own body temperature, which is why they often wake too hot or too cold. Only merino fabric has the remarkable natural ability to regulate body temperature and the Merino Kids baby sleep sack is ideal all-year-round for nursery room temperatures from 64°F to 75°F. It captures and circulates air to insulate your baby when the room temperature falls, and releases excess body heat and moisture as the room temperature rises, to create the perfect safe micro-climate around their body. Your baby has the freedom to move naturally in their Merino Kids baby sleep sack but they cannot slip underneath, nor wriggle out and wake uncovered and cold, as can happen with blankets. Parents get a good night's sleep with the peace of mind that their baby won't get too cold or too hot and their baby's head won't get covered. 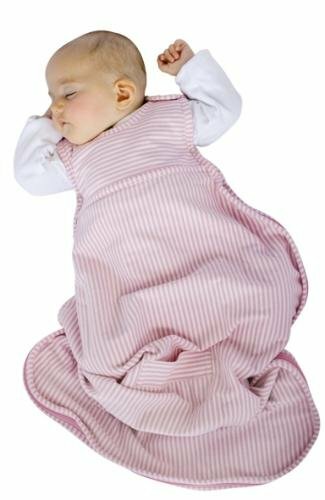 Reduces certain SIDS risk factors: promotes back sleeping; sleeveless for better air circulation; fabric stays clear of baby's face; reduced risk of overheating due to merino's natural body temperature-regulating capability. The innovative safety belt aperture allows the sleep sack to be worn safely in car or stroller, making it easy to transfer them asleep to and from their crib. 100% natural long staple cotton outer layer for extra durability. Opens up flat for easy dressing. Unzips from the bottom for quick diaper changes. Free matching travel bag included. Machine washable. Can be tumble-dried. Contains no polyester. Naturally fire resistant.